CRAZY DISCOUNT! Was: $479.95 Now: $239.97! 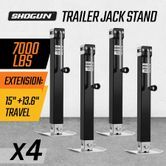 Equipping with The 4X Heavy Duty Trailer Jack Stands is a huge plus for your trailer, which extends the life of your trailer and complements its function. The trailer stand consists of 2.5" outer tube and 2.3" inner tube for strong and reliable load performance. And it supports up to 7000lbs (3175kg). Featured the travel of 15" by the side-wind handle and 13.63" by the bolt, the total height after an extension of trailer jack is 135cm. With a foot plate, the jack adds the stability for your trailer on rough pavement. It is designed to weld on the trailer frame. Suitable for boat trailer, caravan, utility trailer, livestock haulier or recreational vehicle trailer. Great seller. Would deal with again. Very pleased. Items arrived and As described. Dealt quickly with questions. Thanks.